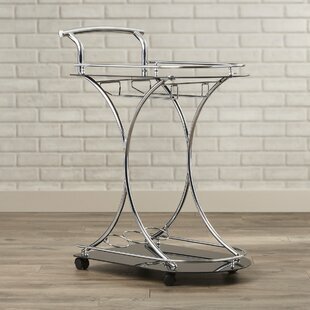 Stylish and functional, this iron bar cart will allow you to storage and transport items around as well as make a statement with your guests. 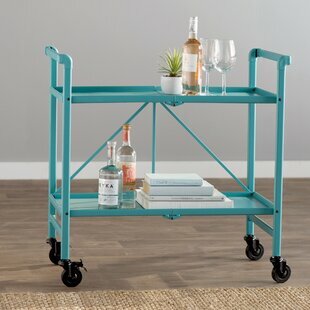 Small enough for easy maneuverability, but large enough for pouring and mixing drinks, this convenient bar cart is a hosting essential for any occasion. 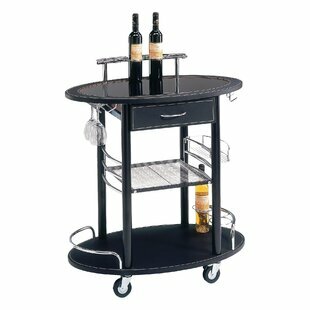 Overall: 34.7 H x 22.9 W x 13 D Frame Material: Metal Top Material: Glass Overall Product Weight: 19lb. 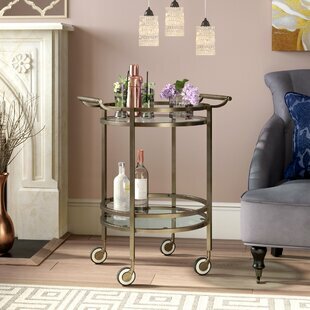 Merging old world industrial design with a touch of midcentury modern flair, this charismatic bar cart lends a splash of eclectic appeal to your ensemble. 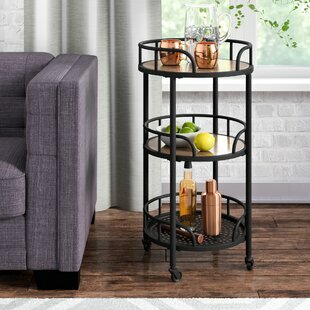 Showcasing a tubular metal frame in an antique brass finish, this charming design features a slatted metal lower shelf and two rustic manufactured wood shelves with distressed ash veneers to provide perfect platforms for handles of your favorite spirits, sets of crystal glassware or copper mugs, ice buckets, and bar tools. Rounding out the... 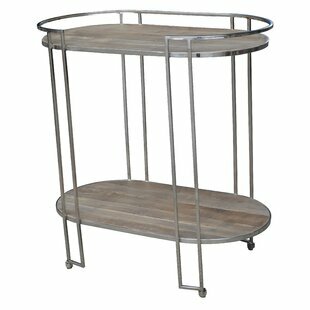 Overall: 29.53 H x 17.72 W x 17.72 D Frame Material: Metal Top Material: Metal; Solid + Manufactured Wood Overall Product Weight: 15.43lb. Total Weight Capacity: 40lb. 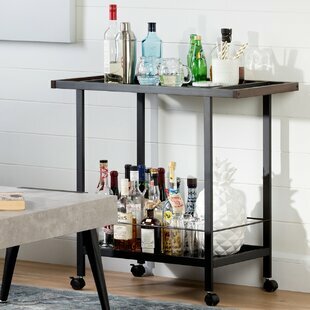 The entertainment center of your home is wherever you want it to be with this clean-lined bar cart, founded atop four caster wheels for must-have mobility. 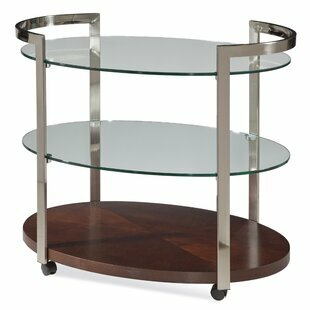 Made with a metal frame, this piece showcases solid wood accents in a walnut finish for a touch of warmth. 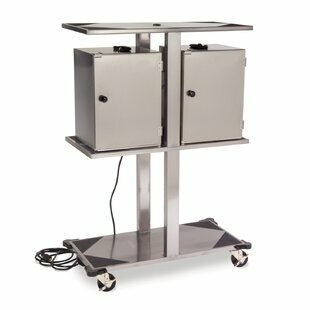 Measuring 30.3" H x 32" W x 16" D, this compact design features a tempered glass top and an open lower tier that provide a place to put up to 30 lbs. of your go-to serveware or a decorative display. Assembly is required. Frame Material: Solid Wood Overall: 30.3 H x 32 W x 16 D Top Material: Glass Overall Product Weight: 29lb. Total Weight Capacity: 30lb. 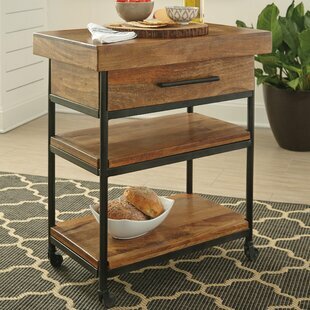 Vintage industrial rustic design kitchen cart with distressed wood top and shelf. Framed in durable metal in black. 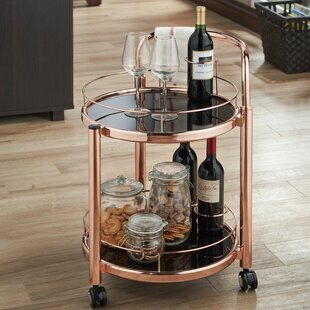 The metal wheels provide the convenience of mobility. 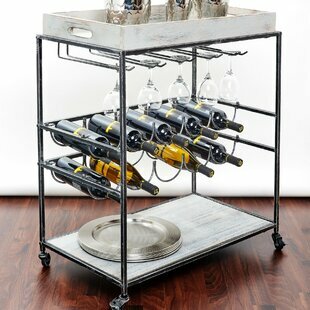 The wine bottle and glass rack make this kitchen serving cart the perfect entertainment piece. 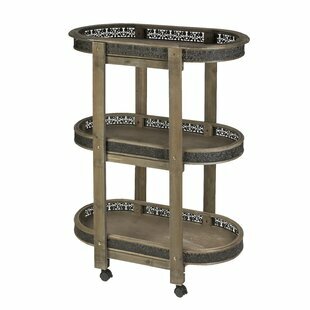 Frame Material: Metal Overall: 31 H x 32 W x 16 D Top Material: Particle Board Overall Product Weight: 35lb. 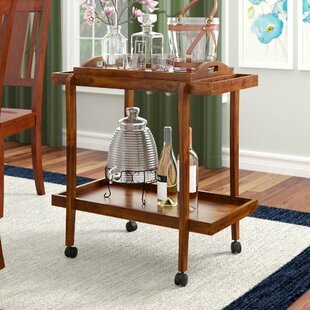 Get the ball rolling with this bar cart in a dining room, living room and bedroom. 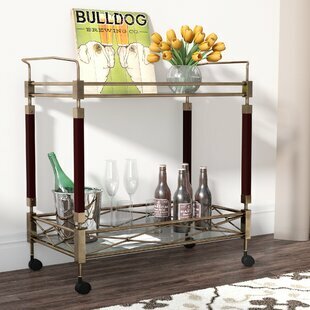 Stair-step design highlights geometric inspirations, while two-tone metallic silver and gold frame shows off gleaming mirrored shelves.Roomy shelves reflect display storage for bedside reading, party spirits or even small kitchen appliances. 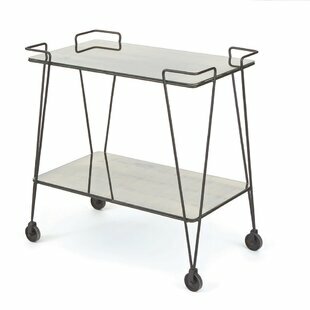 Turn this two-tier cantilevered silhouette into a multipurpose drink tray, nightstand or even reading nook height. 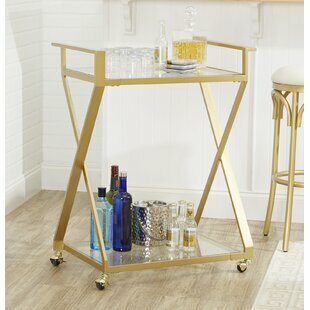 Keep the glam life on the go with this rolling bar cart. 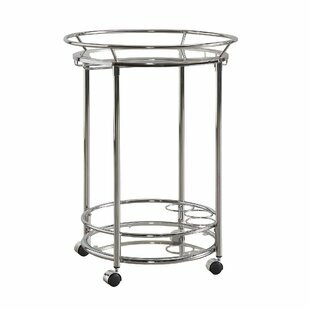 Frame Material: Metal Overall: 32 H x 36 W x 22 D Top Material: Metal; Glass Overall Product Weight: 36lb. Total Weight Capacity: 60lb. 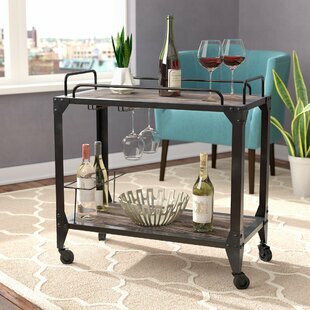 This McLaurin Bar Cart constructed with solid mango wood in a hand worked surface and a medium brown finish. 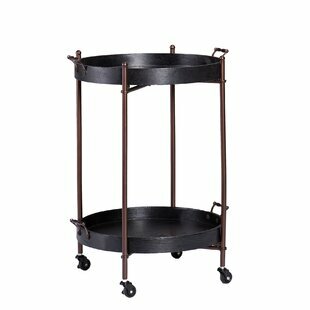 Frame Material: Metal Overall: 32.5 H x 28 W x 18 D Top Material: Solid Wood Overall Product Weight: 72lb. 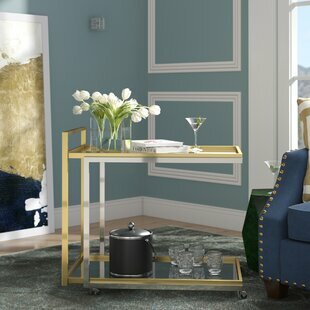 Elegant, yet practical, the antiquebrass cart is ready for service. 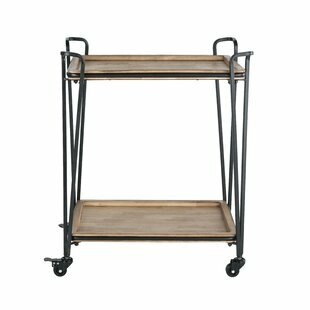 The antique brass frame finish beautifully pairs with indulgent tempered black glass shelves. 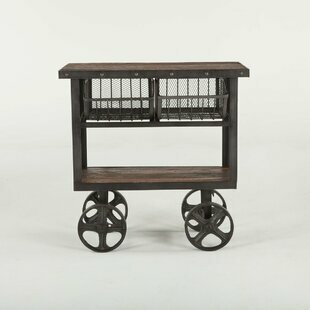 Antique caster wheels and wide bars on either end make this cart easy to maneuver anywhere in your home. 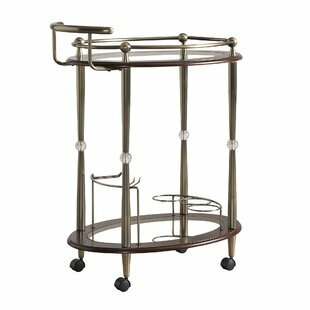 Overall: 33 H x 21 W x 26.5 D Frame Material: Metal Top Material: Glass Overall Product Weight: 27lb. 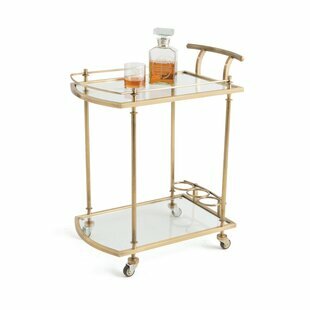 This sophisticated bar cart defines understated elegance. 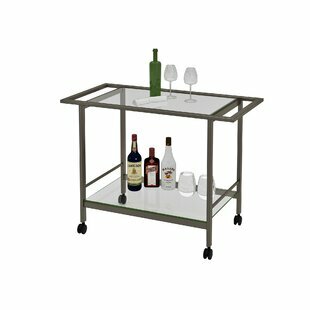 This beverage cart fulfills everything youve desired in wine storage, its portable, provides ample storage. 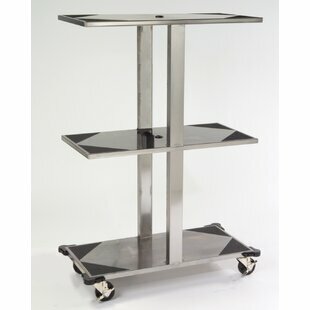 Features include metal construction, 2 glass storage shelves, 2 large handles, clear shelves and 2 locking casters. Overall: 34 H x 26 W x 16 D Frame Material: Metal Top Material: Glass Overall Product Weight: 23.5lb. Total Weight Capacity: 60lb. 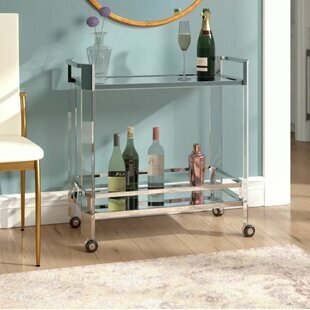 This glamorous modern bar cart is a must-have for anyone that enjoys entertaining. 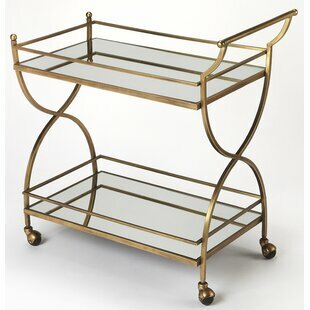 Forged from stainless steel and aluminum, it boasts a mesmerizing antique gold finish with two mirrored glass shelves. 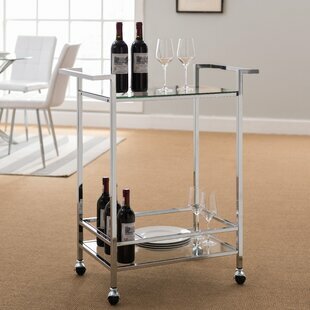 Guests will be sure to follow as four large casters ensure easy mobility from one room to the next. Frame Material: Metal Overall: 30.5 H x 31 W x 18.5 D Top Material: Glass Overall Product Weight: 73lb. Distinctive styling complements the contemporary office. Powder coated steel frame with translucent polycarbonate side panels. 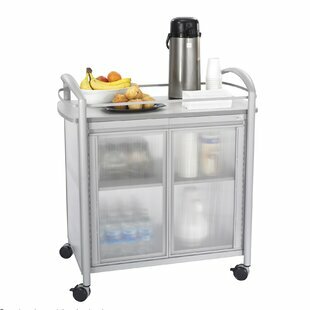 Easy-care laminate top holds beverages and supplies. Large storage area with one fixed shelf behind two translucent hinged doors. Four swivel casters (two locking) for easy mobility. 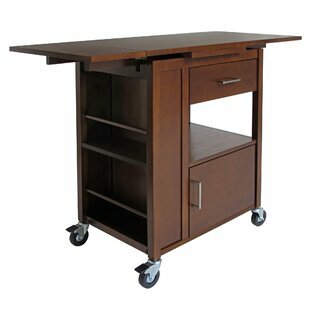 Overall: 36.5 H x 34 W x 21.25 D Frame Material: Metal Top Material: Manufactured Wood Overall Product Weight: 51lb. Total Weight Capacity: 200lb. 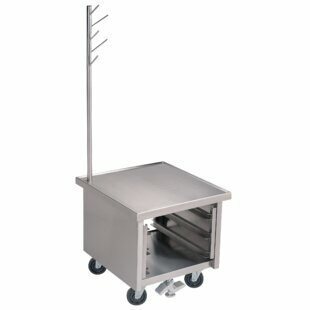 Stainless steel food carrier box storage rack/electrical element boxes and built-in plug strip. 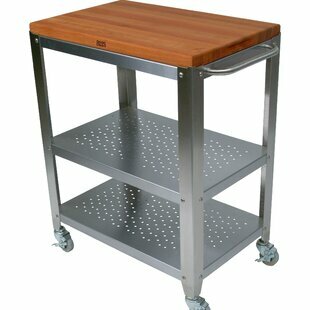 Overall: 56 H x 39.75 W x 20.5 D Frame Material: Metal Top Material: Metal Overall Product Weight: 173lb. 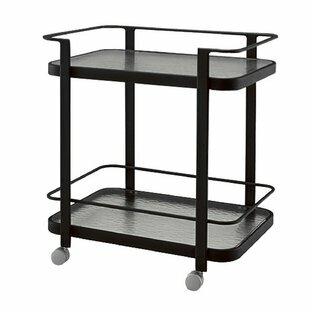 Frame Material: Metal Overall: 33.25 H x 32.75 W x 18.5 D Top Material: Glass Overall Product Weight: 48.96lb. 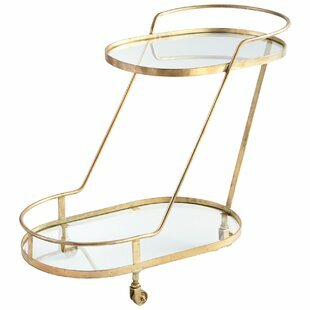 Nothing beats drinking a cocktail than serving one from the glamorous Hayden Bar Cart. 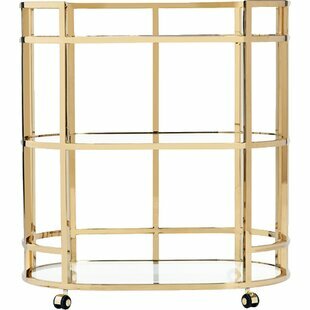 Frame Material: Metal Overall: 36 H x 32 W x 18 D Top Material: Glass Overall Product Weight: 67lb. Total Weight Capacity: 100lb. 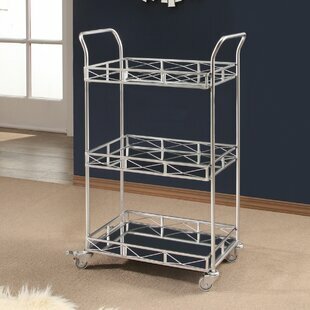 Overall: 36 H x 30.75 W x 17.75 D Frame Material: Metal Top Material: Glass Overall Product Weight: 45lb. Frame Material: Metal Overall: 32.25 H x 20 W x 37 D Top Material: Marble Overall Product Weight: 54lb. 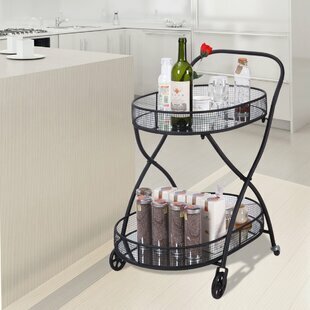 A must-have addition to your kitchen or patio, this lovely serving cart showcases a folding design and neutral finish. 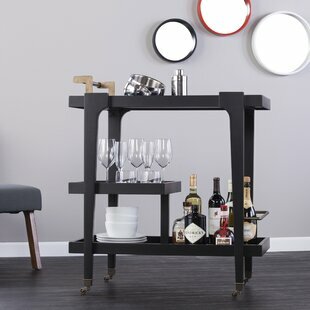 Use it to serve al fresco cocktails or your favorite vintage wine at your next dinner party. 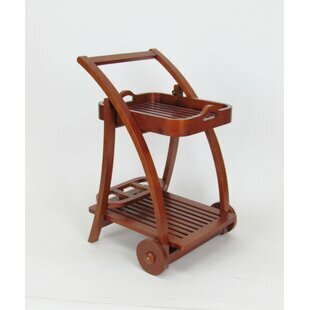 Frame Material: Metal Overall: 33.7 H x 33 W x 19.3 D Top Material: Metal Overall Product Weight: 19.2lb. 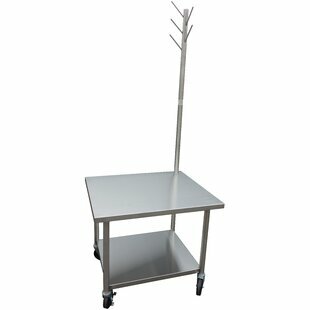 Overall: 30 H x 26.5 W x 27 D Frame Material: Metal Top Material: Metal Overall Product Weight: 85lb. 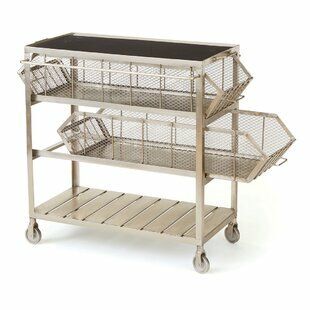 Stainless steel food carrier box storage rack/solid fuel boxes. 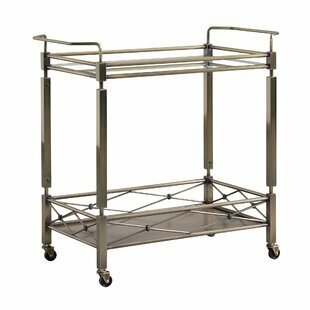 Frame Material: Metal Overall: 56 H x 39.75 W x 20.5 D Top Material: Metal Overall Product Weight: 155lb. Overall: 30 H x 30 W x 30 D Frame Material: Metal Top Material: Metal Overall Product Weight: 75lb.